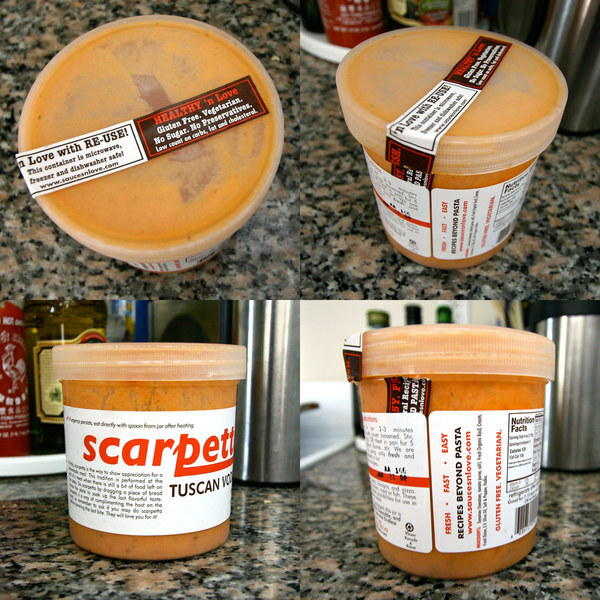 Sauces ‘n Love ~ my recent packaging discovery at the market… although not the ONLY reason i purchase something, its definitely big on my first impressions, so i grabbed this Sauces ‘n Love Tuscan Vodka Scarpetta, and was pleased to see that they come in these nice Re-usable screw cap plastic containers that are microwave, freezer, and diswasher safe! Also nice clean typography on the label ~ and its “Healthy ‘n Love - Gluten Free. Vegetarian. No Sugar. No Preservatives. Low count on Carbs, fat, and choesterol.” And the best part ~ this sauce was incredible. So fresh and delicious. Mmmmm… Close up images of the labels and container below! In Italy, Scarpetta is the way to show appreciation for a homemade meal. This tradition is performed at the end of a meal when there is still a bit of food left on the plate. Do Scarpetta by dragging a piece of bread across the plate to soak up the last flavorful taste. Scarpetta is a way of complimenting the host on the meal, so remember to ask if you may do Scarpetta before savoring the last bite. They will love you for it! And here I thought this was a tribute (or product) of the infamous Kay Scarpetta from the Patricia Cornwell novels!